John Harris after G. H. Laporte. A View near Albert Gate. 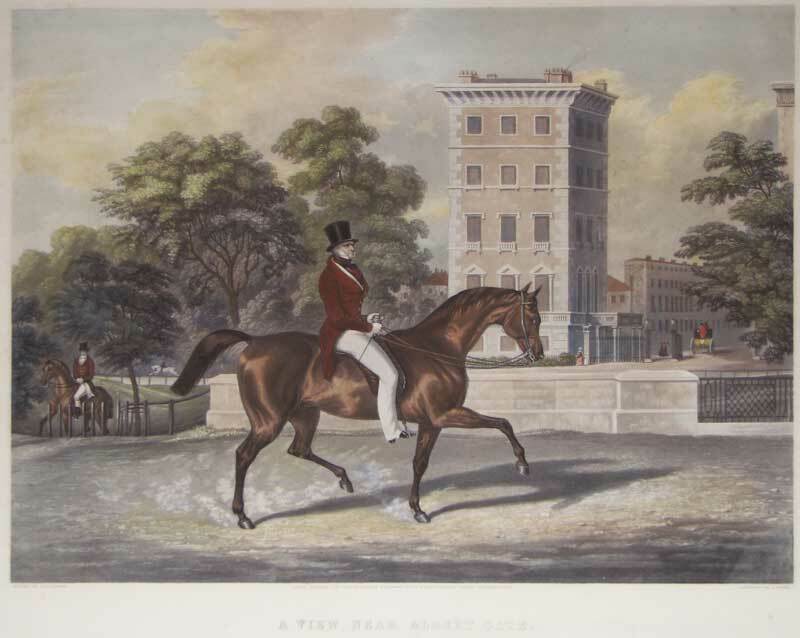 This historic scene depicts Arthur Wellesley (1769-1852), first Duke of Wellington, towards the end of his life, riding his horse along the south carriageway of Hyde Park with Albert Gate in the background. The imposing building shown was designed by Thomas Cubitt, replacing two old inns (The Fox & Bull and The White Hart) that were demolished in 1841. The gate itself was erected in 1846, a year before this print was made. John Harris (1811-1865) was a prolific and highly skilled aquatint engraver whose work epitomises the Victorian love of sporting and coaching art in the middle of the nineteenth century. He produced some of the finest sporting and equestrian prints of his day and worked for well-known publishing firms in London such as Ackermann and Fores. He would have grown up his whole life alongside Arthur Wellesley and been familiar with his spectacular career in both the battle field and the Houses of Parliament; it would have been considered quite an accolade to produce such a fine impression of the duke.